The Roman province of Egypt (Latin: Aegyptus, pronounced [ae̯ˈɡʏptʊs]; Greek: Αἴγυπτος Aigyptos [ɛ́ːɡyptos]) was established in 30 BC after Octavian (the future Roman emperor Augustus) defeated his rival Mark Antony, deposed Pharaoh Cleopatra, and annexed the Ptolemaic Kingdom to the Roman Empire. The province encompassed most of modern-day Egypt except for the Sinai Peninsula (which would later be conquered by Trajan). Aegyptus was bordered by the provinces of Crete and Cyrenaica to the west and Judea (later Arabia Petraea) to the East. Province of Aegyptus in AD 125. The province came to serve as a major producer of grain for the empire and had a highly developed urban economy. Aegyptus was by far the wealthiest Eastern Roman province, and by far the wealthiest Roman province outside of Italia. In Alexandria, its capital, it possessed the largest port, and the second largest city of the Roman Empire. The Roman Empire during the reign of Hadrian (117 – 138). Two legions were deployed in the imperial province of Ægyptus (Egypt) in the year 125. As a key province, but also the 'crown domain' where the emperors succeeded the divine Pharaohs, Egypt was ruled by a uniquely styled Praefectus augustalis ('Augustal prefect'), instead of the traditional senatorial governor of other Roman provinces. The prefect was a man of equestrian rank and was appointed by the Emperor. The first prefect of Aegyptus, Gaius Cornelius Gallus, brought Upper Egypt under Roman control by force of arms, and established a protectorate over the southern frontier district, which had been abandoned by the later Ptolemies. The second prefect, Aelius Gallus, made an unsuccessful expedition to conquer Arabia Petraea and even Arabia Felix. The Red Sea coast of Aegyptus was not brought under Roman control until the reign of Claudius. The third prefect, Gaius Petronius, cleared the neglected canals for irrigation, stimulating a revival of agriculture. Petronius even led a campaign into present-day central Sudan against the Kingdom of Kush at Meroe, whose queen Imanarenat had previously attacked Roman Egypt. Failing to acquire permanent gains, in 22 BC he razed the city of Napata to the ground and retreated to the north. Under Antoninus Pius oppressive taxation led to a revolt in 139, of the native Egyptians, which was suppressed only after several years of fighting. This Bucolic War, led by one Isidorus, caused great damage to the economy and marked the beginning of Egypt's economic decline. Avidius Cassius, who led the Roman forces in the war, declared himself emperor in 175, and was acknowledged by the armies of Syria and Aegyptus. Caracalla (211–217) granted Roman citizenship to all Egyptians, in common with the other provincials, but this was mainly to extort more taxes, which grew increasingly onerous as the needs of the emperors for more revenue grew more desperate. 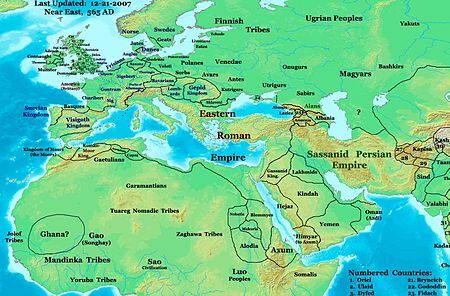 There was a series of revolts, both military and civilian, through the 3rd century. 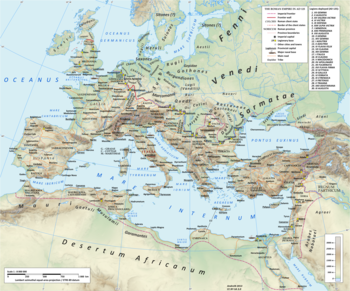 Under Decius, in 250, the Christians again suffered from persecution, but their religion continued to spread. The prefect of Aegyptus in 260, Mussius Aemilianus, first supported the Macriani, usurpers during the rule of Gallienus, and later, in 261, became a usurper himself, but was defeated by Gallienus. Zenobia, queen of Palmyra, took the country away from the Romans when she conquered Aegyptus in 269, declaring herself the Queen of Egypt also. This warrior queen claimed that Egypt was an ancestral home of hers through a familial tie to Cleopatra VII. She was well educated and familiar with the culture of Egypt, its religion, and its language. She lost it later when the Roman emperor, Aurelian, severed amicable relations between the two countries and retook Egypt in 274. Two generals based in Aegyptus, Probus and Domitius Domitianus, led successful revolts and made themselves emperors. Diocletian captured Alexandria from Domitius in 298 and reorganised the whole province. His edict of 303 against the Christians began a new era of persecution. This was the last serious attempt to stem the steady growth of Christianity in Egypt, however. As Rome overtook the Ptolemaic system in place for areas of Egypt, they made many changes. The effect of the Roman conquest was at first to strengthen the position of the Greeks and of Hellenism against Egyptian influences. Some of the previous offices and names of offices under the Hellenistic Ptolemaic rule were kept, some were changed, and some names would have remained but the function and administration would have changed. The Romans introduced important changes in the administrative system, aimed at achieving a high level of efficiency and maximizing revenue. The duties of the prefect of Aegyptus combined responsibility for military security through command of the legions and cohorts, for the organization of finance and taxation, and for the administration of justice. The reforms of the early 4th century had established the basis for another 250 years of comparative prosperity in Aegyptus, at a cost of perhaps greater rigidity and more oppressive state control. Aegyptus was subdivided for administrative purposes into a number of smaller provinces, and separate civil and military officials were established; the praeses and the dux. The province was under the supervision of the count of the Orient (i.e. the vicar) of the diocese headquartered in Antioch in Syria. Emperor Justinian abolished the diocese of Egypt in 538 and re-combined civil and military power in the hands of the dux with a civil deputy (the praeses) as a counterweight to the power of the church authorities. All pretense of local autonomy had by then vanished. The presence of the soldiery was more noticeable, its power and influence more pervasive in the routine of town and village life. Roman trade with India started from Aegyptus according to the Periplus of the Erythraean Sea (1st century). The economic resources that this imperial government existed to exploit had not changed since the Ptolemaic period, but the development of a much more complex and sophisticated taxation system was a hallmark of Roman rule. Taxes in both cash and kind were assessed on land, and a bewildering variety of small taxes in cash, as well as customs dues and the like, was collected by appointed officials. A massive amount of Aegyptus's grain was shipped downriver (north) both to feed the population of Alexandria and for export to the Roman capital. There were frequent complaints of oppression and extortion from the taxpayers. The Roman government had actively encouraged the privatization of land and the increase of private enterprise in manufacture, commerce, and trade, and low tax rates favored private owners and entrepreneurs. The poorer people gained their livelihood as tenants of state-owned land or of property belonging to the emperor or to wealthy private landlords, and they were relatively much more heavily burdened by rentals, which tended to remain at a fairly high level. Overall, the degree of monetization and complexity in the economy, even at the village level, was intense. Goods were moved around and exchanged through the medium of coin on a large scale and, in the towns and the larger villages, a high level of industrial and commercial activity developed in close conjunction with the exploitation of the predominant agricultural base. The volume of trade, both internal and external, reached its peak in the 1st and 2nd centuries. By the end of the 3rd century, major problems were evident. A series of debasements of the imperial currency had undermined confidence in the coinage, and even the government itself was contributing to this by demanding more and more irregular tax payments in kind, which it channeled directly to the main consumers, the army personnel. Local administration by the councils was careless, recalcitrant, and inefficient; the evident need for firm and purposeful reform had to be squarely faced in the reigns of Diocletian and Constantine I. This wealthiest of provinces could be held militarily by a very small force; and the threat implicit in an embargo on the export of grain supplies, vital to the provisioning of the city of Rome and its populace, was obvious. Internal security was guaranteed by the presence of three Roman legions (later reduced to two, then one Legio II Traiana) stationed at the grand capital Alexandria. Each of these numbered around 5000 strong, and several units of auxiliaries. In the first decade of Roman rule the spirit of Augustan imperialism looked farther afield, attempting expansion to the east and to the south. Most of the early Roman troops stationed there were Greco-Macedonians and native Egyptians once part of the dissolved Ptolemaic army finding service for Rome. Eventually Romans or Romanized people were a majority. The social structure in Aegyptus under the Romans was both unique and complicated. On the one hand, the Romans continued to use many of the same organizational tactics that were in place under the leaders of the Ptolemaic period. At the same time, the Romans saw the Greeks in Aegyptus as “Egyptians”, an idea that both the native Egyptians and Greeks would have rejected. To further compound the whole situation, Jews, who themselves were very Hellenized overall, had their own communities, separate from both Greeks and native Egyptians. The Romans began a system of social hierarchy that revolved around ethnicity and place of residence. Other than Roman citizens, a Greek citizen of one of the Greek cities had the highest status, and a rural Egyptian would be in the lowest class. In between those classes was the metropolite, who was almost certainly of Hellenic origin. Gaining citizenship and moving up in ranks was very difficult and there were not many available options for ascendancy. One of the routes that many followed to ascend to another caste was through enlistment in the army. Although only Roman citizens could serve in the legions, many Greeks found their way in. The native Egyptians could join the auxiliary forces and attain citizenship upon discharge. The different groups had different rates of taxation based on their social class. The Greeks were exempt from the poll tax, while Hellenized inhabitants of the nome capitals were taxed at a lower rate than the native Egyptians, who could not enter the army, and paid the full poll tax. The social structure in Aegyptus is very closely linked to the governing administration. Elements of centralized rule that were derived from the Ptolemaic period lasted into the 4th century. One element in particular was the appointment of strategoi to govern the ‘nomes’, the traditional administrative divisions of Egypt. Boulai, or town councils, in Egypt were only formally constituted by Septimius Severus. It was only under Diocletian later in the 3rd century that these boulai and their officers acquired important administrative responsibilities for their nomes. The Augustan takeover introduced a system of compulsory public service, which was based on poros (property or income qualification), which was wholly based on social status and power. The Romans also introduced the poll tax which was similar to tax rates that the Ptolemies levied, but the Romans gave special low rates to citizens of metropolises. The city of Oxyrhynchus had many papyri remains that contain much information on the subject of social structure in these cities. This city, along with Alexandria, shows the diverse set-up of various institutions that the Romans continued to use after their takeover of Egypt. Just as under the Ptolemies, Alexandria and its citizens had their own special designations. The capital city enjoyed a higher status and more privileges than the rest of Egypt. Just as it was under the Ptolemies, the primary way of becoming a citizen of Roman Alexandria was through showing when registering for a deme that both parents were Alexandrian citizens. Alexandrians were the only Egyptians that could obtain Roman citizenship. If a common Egyptian wanted to become a Roman citizen he would first have to become an Alexandrian citizen. The Augustan period in Egypt saw the creation of urban communities with “Hellenic” landowning elites. These landowning elites were put in a position of privilege and power and had more self-administration than the Egyptian population. Within the citizenry, there were gymnasiums that Greek citizens could enter if they showed that both parents were members of the gymnasium based on a list that was compiled by the government in 4–5 AD. The candidate for the gymnasium would then be let into the ephebus. There was also the council of elders known as the gerousia. This council of elders did not have a boulai to answer to. All of this Greek organization was a vital part of the metropolis and the Greek institutions provided an elite group of citizens. The Romans looked to these elites to provide municipal officers and well-educated administrators. These elites also paid lower poll-taxes than the local native Egyptians, fellahin. It is well documented that Alexandrians in particular were able to enjoy lower tax-rates on land. These privileges even extended to corporal punishments. Romans were protected from this type of punishment while native Egyptians were whipped. Alexandrians, on the other hand, had the privilege of merely being beaten with a rod. Although Alexandria enjoyed the greatest status of the Greek cities in Egypt, it is clear that the other Greek cities, such as Antinoopolis, enjoyed privileges very similar to the ones seen in Alexandria. All of these changes amounted to the Greeks being treated as an ally in Egypt and the native Egyptians were treated as a conquered race. The Gnomon of the Idios Logos shows the connection between law and status. It lays out the revenues it deals with, mainly fines and confiscation of property, to which only a few groups were apt. The Gnomon also confirms that a freed slave takes his former master’s social status. The Gnomon demonstrates the social controls that the Romans had in place through monetary means based on status and property. The Patriarchate of Alexandria is held to be founded by Mark the Evangelist around 42. The ancient religion of Egypt put up surprisingly little resistance to the spread of Christianity. Possibly its long history of collaboration with the Greek and Roman rulers of Egypt had robbed its religious leaders of authority. Alternatively, the life-affirming native religion may have begun to lose its appeal among the lower classes as a burden of taxation and liturgical services instituted by the Roman emperors reduced the quality of life. In a religious system which views earthly life as eternal, when earthly life becomes strained and miserable, the desire for such an everlasting life loses its appeal. Thus, the focus on poverty and meekness found a vacuum among the Egyptian population. In addition, many Christian tenets such as the concept of the trinity, a resurrection of deity and union with the deity after death had close similarities with the native religion of ancient Egypt. Or it may simply have been because branches of the native religion and Christianity had converged to a point where their similarities made the change a minor one. By 200 it is clear that Alexandria was one of the great Christian centres. The Christian apologists Clement of Alexandria and Origen both lived part or all of their lives in that city, where they wrote, taught, and debated. With the Edict of Milan in 313, Constantine I ended the persecution of Christians. Over the course of the 5th century, paganism was suppressed and lost its following, as the poet Palladius bitterly noted. It lingered underground for many decades: the final edict against paganism was issued in 435, but graffiti at Philae in Upper Egypt proves worship of Isis persisted at its temples into the 6th century. Many Egyptian Jews also became Christians, but many others refused to do so, leaving them as the only sizable religious minority in a Christian country. No sooner had the Egyptian Church achieved freedom and supremacy than it became subject to a schism and prolonged conflict which at times descended into civil war. Alexandria became the centre of the first great split in the Christian world, between the Arians, named for the Alexandrian priest Arius, and their opponents, represented by Athanasius, who became Archbishop of Alexandria in 326 after the First Council of Nicaea rejected Arius's views. The Arian controversy caused years of riots and rebellions throughout most of the 4th century. In the course of one of these, the great temple of Serapis, the stronghold of paganism, was destroyed. Athanasius was alternately expelled from Alexandria and reinstated as its Archbishop between five and seven times. Egypt had an ancient tradition of religious speculation, enabling a variety of controversial religious views to thrive there. Not only did Arianism flourish, but other doctrines, such as Gnosticism and Manichaeism, either native or imported, found many followers. Another religious development in Egypt was the monasticism of the Desert Fathers, who renounced the material world in order to live a life of poverty in devotion to the Church. Egyptian Christians took up monasticism with such enthusiasm that the Emperor Valens had to restrict the number of men who could become monks. Egypt exported monasticism to the rest of the Christian world. Another development of this period was the development of Coptic, a form of the Ancient Egyptian language written with the Greek alphabet supplemented by several signs to represent sounds present in Egyptian which were not present in Greek. It was invented to ensure the correct pronunciation of magical words and names in pagan texts, the so-called Greek Magical Papyri. Coptic was soon adopted by early Christians to spread the word of the gospel to native Egyptians and it became the liturgical language of Egyptian Christianity and remains so to this day. A map of the Near East in 565, showing Byzantine Egypt and its neighbors. The reign of Constantine also saw the founding of Constantinople as a new capital for the Roman Empire, and in the course of the 4th century the Empire was divided in two, with Egypt finding itself in the Eastern Empire with its capital at Constantinople. Latin, never well established in Egypt, would play a declining role with Greek continuing to be the dominant language of government and scholarship. During the 5th and 6th centuries the Eastern Roman Empire, today known as the Byzantine Empire, gradually transformed itself into a thoroughly Christian state whose culture differed significantly from its pagan past. The fall of the Western Empire in the 5th century further isolated the Egyptian Romans from Rome's culture and hastened the growth of Christianity. The triumph of Christianity led to a virtual abandonment of pharaonic traditions: with the disappearance of the Egyptian priests and priestesses who officiated at the temples, no-one could read the hieroglyphs of Pharaonic Egypt, and its temples were converted to churches or abandoned to the desert. The Eastern Empire became increasingly "oriental" in style as its links with the old Græco-Roman world faded. The Greek system of local government by citizens had now entirely disappeared. Offices, with new Byzantine names, were almost hereditary in the wealthy land-owning families. Alexandria, the second city of the empire, continued to be a centre of religious controversy and violence. Cyril, the patriarch of Alexandria, convinced the city's governor to expel the Jews from the city in 415 with the aid of the mob, in response to the Jews' alleged nighttime massacre of many Christians. The murder of the philosopher Hypatia in March 415 marked the final end of classical Hellenic culture in Egypt. Another schism in the Church produced a prolonged civil war and alienated Egypt from the Empire. The new religious controversy was over the nature of Jesus of Nazareth. The issue was whether he had two natures, human and divine, or a combined one (hypostatic union from His humanity and divinity). This may seem an arcane distinction, but in an intensely religious age it was enough to divide an empire. The Miaphysite controversy arose after the First Council of Constantinople in 381 and continued until the Council of Chalcedon in 451, which ruled in favour of the position that Jesus was "In two natures" due to confusing Miaphytism (combined) with Monophystism (single). The Monophysite belief was not held by the miaphysites as they stated that Jesus was out of two natures in one nature called, the "Incarnate Logos of God". Many of the miaphysites claimed that they were misunderstood, that there was really no difference between their position and the Chalcedonian position, and that the Council of Chalcedon ruled against them because of political motivations alone. The Church of Alexandria split from the Churches of Rome and Constantinople over this issue, creating what would become the Coptic Orthodox Church of Alexandria, which remains a major force in Egyptian religious life today. Egypt and Syria remained hotbeds of Miaphysite sentiment, and organised resistance to the Chalcedonian view was not suppressed until the 570s. Egypt nevertheless continued to be an important economic center for the Empire supplying much of its agriculture and manufacturing needs as well as continuing to be an important center of scholarship. It would supply the needs of the Byzantine Empire and the Mediterranean as a whole. The reign of Justinian (527–565) saw the Empire recapture Rome and much of Italy from the barbarians, but these successes left the empire's eastern flank exposed. The Empire's "bread basket" now lacked protection. The Byzantine Empire in 629 after Heraclius had reconquered Syria, Palestine and Egypt from the Sassanid Empire. The Persian conquest of Egypt, beginning in AD 619 or 618, was one of the last Sassanid triumphs in the Roman-Persian Wars against Byzantium. From 619 - 628, they incorporated Egypt once again within their territories, the previous (much longer) time being under the Achaemenids. Khosrow II Parvêz had begun this war in retaliation for the assassination of Emperor Maurice (582–602) and had achieved a series of early successes, culminating in the conquests of Jerusalem (614) and Alexandria (619). A Byzantine counteroffensive launched by Emperor Heraclius in the spring of 622 shifted the advantage, and the war was brought to an end by the fall of Khosrow on 25 February 628 (Frye, pp. 167–70). The Egyptians had no love of the emperor in Constantinople and put up little resistance. Khosrow's son and successor, Kavadh II Šêrôe (Šêrôy), who reigned until September, concluded a peace treaty returning territories conquered by the Sassanids to the Eastern Roman Empire. The Persian conquest allowed Miaphysitism to resurface in the open in Egypt, and when imperial rule was restored by Emperor Heraclius in 629, the Miaphysites were persecuted and their patriarch expelled. Egypt was thus in a state of both religious and political alienation from the Empire when a new invader appeared. The Mediterranean world in 650, after the Arabs had conquered Egypt and Syria from the Byzantines. An army of 4,000 Arabs led by Amr Ibn Al-Aas was sent by the Caliph Umar, successor to Muhammad, to spread Islamic rule to the west. Arabs crossed into Egypt from Palestine in December 639, and advanced rapidly into the Nile Delta. The Imperial garrisons retreated into the walled towns, where they successfully held out for a year or more. The Arabs sent for reinforcements, and in April 641 they besieged and captured Alexandria. The Byzantines assembled a fleet with the aim of recapturing Egypt, and won back Alexandria in 645. The Muslims retook the city in 646, completing the Muslim conquest of Egypt. 40,000 civilians were evacuated to Constantinople with the imperial fleet. Thus ended 975 years of Græco-Roman rule over Egypt. Funerary masks uncovered in Faiyum, 1st century. Hadrian coin celebrating Ægyptus Province, struck c. 135. In the obverse, Egypt is personified as a reclining woman holding the sistrum of Hathor. Her left elbow rests on a basket of grain, while an ibis stands on the column at her feet. Zenobia coin reporting her title as queen of Egypt (Augusta), and showing her diademed and draped bust on a crescent. The obverse shows a standing figure of Ivno Regina (Juno) holding a patera in her right hand and a sceptre in her left hand, with a peacock at her feet and a brilliant star on the left. ^ Publishing, Britannica Educational (2010-04-01). Ancient Egypt: From Prehistory to the Islamic Conquest. Britannica Educational Publishing. ISBN 9781615302109. ^ Wickham, Chris (2009-01-29). The Inheritance of Rome: A History of Europe from 400 to 1000. Penguin UK. ISBN 9780141908533. ^ Christiansen, Erik (2004). Coinage in Roman Egypt: The Hoard Evidence. Aarhus University Press. ^ a b Turner, E. G. (1975). "Oxyrhynchus and Rome". Harvard Studies in Classical Philology. 79: 1–24 [p. 3]. JSTOR 311126. ^ Alston, Richard (1997). "Philo's In Flaccum: Ethnicity and Social Space in Roman Alexandria". Greece and Rome. Second Series. 44 (2): 165–175 [p. 166]. doi:10.1093/gr/44.2.165. ^ Lewis, Naphtali (1995). "Greco-Roman Egypt: Fact or Fiction?". On Government and Law in Roman Egypt. Atlanta: Scholars Press. p. 145. ^ Bell, Idris H. (1922). "Hellenic Culture in Egypt". Journal of Egyptian Archaeology. 8 (3/4): 139–155 [p. 148]. JSTOR 3853691. ^ Sherwin-White, A. N. (1973). The Roman Citizenship. Oxford: Clarendon Press. p. 391. ^ a b Turner, E. G. "Roman Oxyrhynchus". Journal of Egyptian Archaeology. 38: 78–93 [p. 84]. JSTOR 3855498. ^ Delia, Diana (1991). Alexandrian Citizenship During the Roman Principate. Atlanta: Scholars Press. p. 31. ^ "Egypt". Berkley Center for Religion, Peace, and World Affairs. Retrieved 2011-12-14. See drop-down essay on "Islamic Conquest and the Ottoman Empire"
Riggs, Christina, ed. (2012). The Oxford Handbook of Roman Egypt. Oxford University Press. ISBN 978-0-19-957145-1.